"Did you know there was once a girl who turned into a swan?" The melding of Tchaikovsky and Barbie might make some people initially wince, but this is the second time that director Owen Hurley has deftly merged the grandeur of classical music and a pop culture icon (the first time was Barbie in the Nutcracker). The end result is not as crassly commercial as one might expect, and actually very well done, considering the target audience is under the age of eight. 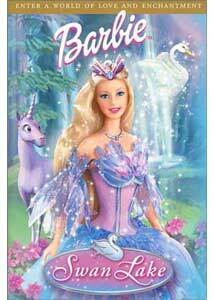 In an attempt to instill a valuable lesson to youngster Kelly, Barbie (voiced by Kelly Sheridan) explains the story of Odette (also played by Barbie), the young daughter of a baker who ends up in the Enchanted Forest after following a purple unicorn. Odette runs afoul of the evil Rothbart (voiced by Kelsey Grammer), a typically nasty wizard hellbent on defeating the ethereal Fairy Queen, and without warning, Odette is turned into a swan. The fate of the Enchanted Forest lies on her feathery back, and of course there is a dashing prince, a magic crystal, and suitable comic relief from Rothbart's egotistical daughter, all set to Tchaikovsky's majestic composition. The CGI animation is sometimes a bit blocky and stiff, and at best it resembles the look and texture of a video game. The three-dimensional feel to the locations, combined with some sweeping camera work, work to give a more cinematic undertone to things, but the character movements never seem as fluid as they need to be. But hey, let's not over analyze Barbie of Swan Lake too much, because deep down we know the intended audience will drool and swoon over Odette's journey through the Enchanted Forest, the dancing animal-children, and her big chase scene with Rothbart during the frantic final moments. As with Barbie in the Nutcracker, the music is performed by the London Symphony Orchestra, and the ballet choreography is overseen by Peter Martins, Ballet Master in Chief of the New York City Ballet. That's a pretty respectable pedigree for a Barbie product, and though the CGI animation doesn't do justice to the ballet sequences, it is an impressive set of credentials for a kids' title. The ballet sequences are plopped in between the more traditional linear story elements, and whether or not young girls will sit in awe of animated characters performing pirouettes is another story. But seeing as this is Barbie, and her word is often law amongst young girls, I suspect the little ones will fall right in line. Image Transfer Review: As with their previous Barbie titles, Artisan has graciously offered the film in two formats: 1.33:1 full-frame (for those youngsters not yet converted to the joys of widescreen) and of course the preferred 1.85:1 widescreen print, both on the same side of this dual-layered disc. I'm not a big fan of the style of animation used here, but it is rendered in a gorgeous, colorful transfer, with razor-sharp image detail. Audio Transfer Review: Artisan has included a Dolby Digital 5.1 surround track that wonderfully showcases The London Symphony Orchestra performing Tchaikovsky, and character voices sound crisp, with all manner of ambient sounds swirling in from the available channels. It may be a kids title, but this is an impressive sounding disc. There are also a pair of 2.0 mixes (English and Spanish) and both are expectedly far less robust than the 5.1 track. Extras Review: Considering how relentlessly Mattel markets Barbie, it should be noted that this disc is comparatively low-key in its presentation of the blonde wondergirl. Aside from a couple of inserts, the disc itself has very little in the way of direct commercial advertising, and instead features pleasantly inspirational stuff like The Music in You (25m:25s), a short film outlining five girls who are pursuing careers in music. The Ballet Dances of Swan Lake replays four scenes from the film, with instructional voiceover from Barbie. A trio of Barbie trailers, an Explore the Stars matching game, and 21 chapters round out the traditional supplements. When you're all done, you can pop this into your DVD-ROM drive, and you will find a demo of the Barbie of Swan Lake computer game. Little girls love Barbie, and this disc will not just appease their need to watch their idol, but it will expose them to Tchaikovsky's classic composition at the same time. Recommended for the Barbie fan in your house.